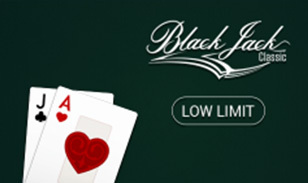 Blackjack Classic Low is variant with lower betting limits that make it ideal for all low rolling players. This game has simple yet high-quality graphics with a professional tone that makes you feel like you are in a real casino. The game is powered by three hands and three side bet positions as well. Played with four decks of 52 cards, this game helps you win from three hands at once. The benefit of three hands is to try a different strategy on each hand and find out which one works best. The betting limit starts with as low as 10p and maximum is just £5 per hand. So the max you can bet from three hands is £15 per game. The developer of this amazing low betting range blackjack variant is NetEnt. They are popular for several games from various different casino categories such as slot, tables, jackpots and progressive jackpots. They build their games using modern technologies that enable them to allow users play using mobile devices as well. Blackjack Classic Low is played with three separate hands and you can pick any number of hands as per your choice. You can place the same amount of betting on all three hands or different ones too. The rules remain same as any other variant, where you need to defeat the dealer’s hand. To do so, you must make total points that are closer to 21 than the dealer. Since the dealer has to stand on 17, it is not difficult to win, provided you use appropriate strategy. The game gives an option to play a side game where you can win additional prizes. Insurance Feature: When the dealer gets an ace as an open card, it is highly likely that he can get a BJ hand. So to avoid you from losing, insurance is offered. Should the dealer get BJ after you take insurance, you are still paid two to one your wagered amount. The catch here is, you need to shell out 50% of your betting as a fee. Side Game: The double jack is the side game of Blackjack Classic Low. Here you can win if you get jack as the first card and you are paid ten times on your bet. If both are jacks from different suits, you win 25x and 100x if two jack of spades shows up. As the name suggests, Blackjack Classic Low is for budget players with a lower limit.